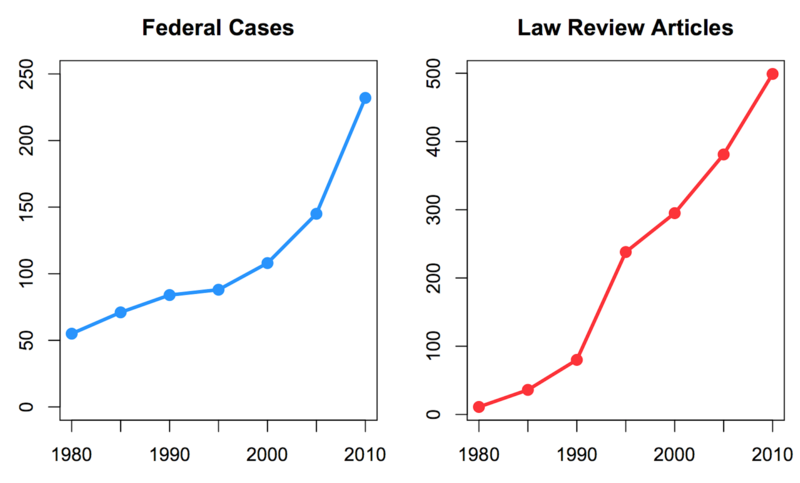 These graphs show the frequency of the term “statistical significance” or “statistically significant” in judicial opinions and law review articles over time. The graphs should not be surprising and yet they should also be alarming for the legal profession. Few lawyers and hardly any judges have statistical training or more than a rudimentary understanding of statistics. This is all too evident in judicial opinions. Law schools are just beginning to catch up–by hiring people with statistical training–but haven’t figure out a way to give students usable statistical knowledge. There are some helpful books–most recently, An Introduction to Empirical Legal Research by Lee Epstein and Andrew Martin. We highly recommend it. Holmes said that “For the rational study of the law the blackletter man may be the man of the present, but the man of the future is the man of statistics and the master of economics.” His prediction is finally coming true. But are our students prepared?